DRELFIE | What Does DRELFIE Mean? DRELFIE means "Drunken Selfie" or "Drinking Selfie". It is a photographic self-portrait taken when drunk or drinking alcohol. DRELFIES are usually posted on social-media networks (usually Instagram or Facebook). The image shows two people taking a selfie whilst drunk. Person A: We took so many DRELFIES last night! Person B: I know. I had to untag all the embarrasing ones this morning! 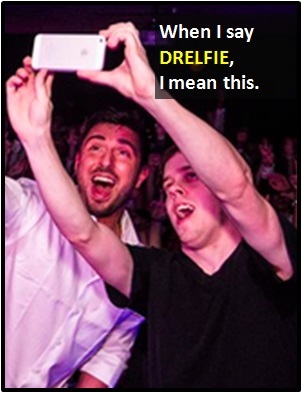 The term DRELFIE is an amalgam of the words "drunken" and "selfie." Our Slide Show "The Evolution of the SELFIE"
Read more about the different types of SELFIE.